Conroe police sergeant Jason Blackwelder was convicted of manslaughter for fatally shooting a 19 year old suspected shoplifter, Russell Rios, who’d fled from a Walmart into the woods. The officer claimed there had been a struggle which led to the shooting. Prosecutors say, however, that the teen was shot in the back of the head – making this explanation impossible. 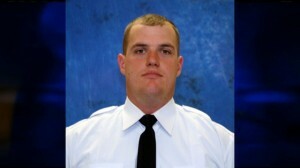 For a law enforcement officer to be convicted by a Texas jury in an officer involved shooting incident is VERY RARE. I liken it to finding Sasquatch riding a unicorn. Today is a good day for justice. Science was not on Blackwelder’s side. His story was never going to hold water – it was physically impossible for him to have gotten into a struggle and discharged his firearm in the back of the young teen’s head. Regardless, huge victory today for civil rights and for the memory of a young man. Finally a jury in Texas has reached the conclusion that the police are not immune from criminal conviction. They have to follow the law just like everybody else. I understand why the prosecution only went for manslaughter and not murder – so they could get a conviction. But the truth is, this guy should have been convicted of murder.